No matter your age, the best exercise for you is the one you enjoy the most. After all, if you don’t like your workout, how long are you going to stick with it? Still, when sampling any of the countless forms of exercise out there, it’s important to keep in mind exactly what you want and need to get out of your workout. And that’s bound to change throughout the years, says Barbara Bergin, M.D., an orthopedic surgeon in Austin. She explains that, for older adults, the number-one priority must be maintaining your quality of life outside the gym. To do that, focus on workouts designed to help you build strength, stay mobile, and improve balance and stability. Also key is considering the requirements of any given fitness option. Are your bones strong enough for high-impact exercises such as running and jumping? Is your balance where it needs to be for fall-free bike rides? How much time to do you realistically have to spend at the gym? 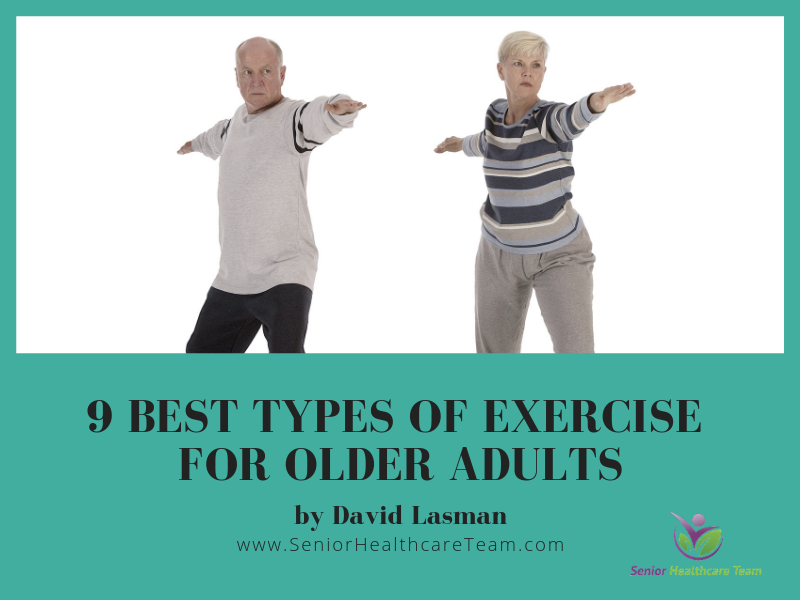 Below, experts share the best types of exercise for older adults. As always, it’s smart to check with your doctor before beginning a new fitness program, especially if you have a health condition. The good news: Assuming your doctor hasn’t said a type of exercise is off-limits, choose whatever you like—they’re all terrific. There’s a reason swimming is called the world’s perfect exercise. Whether you’re performing the breaststroke, taking a water aerobics class, or playing Marco Polo with the grandkids, getting in the pool is a great way to increase your cardiovascular fitness while also strengthening your muscles, says Victoria Shin, M.D., a cardiologist at Torrance Memorial Medical Center in California. It does all this while putting minimal stress on your bones and joints, which is a major plus for men and women who have arthritis or osteoporosis. As if that isn’t enough reason to jump in, a 2012 study published in the Journal of Aging Research suggests that swimming can help older adults keep their minds as sharp as their bodies. Not a swimmer? You can still benefit from water exercise. If you’re a confident swimmer, you can swim on your own. And when the weather is nice, take advantage by moving your swim sessions outdoors. Research consistently links time in nature with improved mental and physical health. With a holistic approach to fitness, yoga helps build muscle strength, aerobic fitness, balance, core stability, mobility, and flexibility—all of which are important for older adults, says David Kruse, M.D., a sports medicine specialist at Hoag Orthopedic Institute in Orange, California. And while yoga is low-impact and gentle on your body’s joints, it’s still weight-bearing, meaning that you have to support your body’s weight with every posture. That’s vital to strengthening not just your muscles, but also your bones. If you are new to yoga, look for an introductory class that will teach you the basics. SilverSneakers Yoga is made for older adults. Restorative, hatha, and Iyengar classes are also great options. Talk to your class instructor about any physical limitations before getting started. Like yoga, Pilates is known for being a low-impact strength program, but its focus on core strength and stability makes it especially great for older adults, Dr. Shin says. One 2014 analysis published in the European Review of Aging and Physical Activity concluded that Pilates participation improves balance in older adults. Most gyms offer Pilates classes designed for first-timers, which is especially important for those exercisers interested in classes that rely on the “reformer,” an exercise machine that uses springs, bars, and straps for resistance. One out of every three older adults experiences severe muscle loss, according to an analysis published in Age and Ageing. Meanwhile, when it comes to fighting age-related abdominal fat—a marker for overall health—Harvard research shows that strength training is more time-efficient compared to cardiovascular exercise. Fortunately, you don’t have to bench press your bodyweight to keep your muscles healthy and prevent fat gain over the years, says Dr. Shin. In fact, she notes, for most older adults, it’s far safer to start small. Simple bodyweight exercises such as chair squats, single-leg stands, wall pushups, and stair climbing will do a great job at keeping your body strong and ready to tackle everyday activities. Your gym undoubtedly has an array of resistance bands ready for use, but these inexpensive and beginner-friendly exercise tools are perfect for at-home workouts as well, Dr. Shin says. In addition, bands can help you challenge your muscles in ways you might not be able to with equipment-free training. For instance, when it comes to strengthening your back (important for good, strong posture), rows and other pulling motions are vital—but hard to do if you don’t have any exercise equipment on hand. Even if you can’t find the time to perform a structured workout, you likely have time to put one foot in front of the other to get where you need to go, says Dr. Shin, who recommends most people take 10,000 steps per day, even on days they don’t “work out.” Research published in PLOS One found that people who increased their activity levels to 10,000 steps per day were 46 percent less likely to die in the following 10 years compared to those who stayed sedentary. For some older adults or people with a chronic condition, 10,000 may not be the right exact number. But the fact remains: Walking is a great, free workout that can have a big impact on your health. Easy ways to increase your step count include parking farther from the supermarket door, playing with your grandkids, taking the long route wherever you need to go, and even walking your dog. Check out these tips and the video below for awesome ways to mix up your walking workout. Another low-impact form of exercise, cycling is ideal for those who want to increase their leg strength, but can’t run or engage in other high-impact sports due to osteoporosis or joint issues, Dr. Shin says. A 2017 analysis published in the European Review of Aging and Physical Activity found that cycling also helps improve cardiovascular health, metabolic health, function, and cognitive performance in adults older than 70. If you have cycling trails near your home, consider scheduling regular bike rides with family or friends. Indoor cycling classes are another great option for those without access to trails or when weather conditions aren’t ideal. Plus, with a stationary bike, you don’t have to worry about falls or needing to wear a helmet. If you attend classes, you already know that group exercise isn’t just a fantastic way break a sweat. You’ll also have tons of fun and make new friends along the way, both of which are hugely important when it comes to making exercise a habit. In fact, 2017 research published in BMC Public Health notes that the social aspect of group exercise programs increases activity levels in older adults over the long term. If you’re looking for more attention and instruction than group classes provide, working with a personal trainer is a great path to fitness and fun. Many offer one-on-one and small-group sessions, the latter in which you and one to three of your friends perform the same workout with the trainer. Make it easier on your wallet by using one-on-one sessions to help you get started with a program you can continue on your own or going the small-group route. No matter which option you choose, the trainer will help you master proper form and build a solid base of exercise knowledge that you can carry with you for years to come. In addition, your workouts will likely blend elements from all of the above forms of exercise. When choosing a trainer, make sure he or she is certified through a governing body like the American College of Sports Medicine, the National Strength and Conditioning Association, or the National Academy of Sports Medicine. Bonus points if they have a history of training older adults.